SaferVPN claims to have blazing speeds and unlimited access with zero limits. In this review we put SaferVPN to the test, to determine whether their performance backs up their boasts. As of 2018, SaferVPN has over 700 servers in 35 different locations, scattered all over the globe. They cover countries like the United States, the United Kingdom, Hong Kong, Germany, Australia, and Israel, as well as others. It’s a decently high amount, but we’ve seen VPNs offer two or even three thousand; so putting it simply, it’s a solid offering, but it’s nowhere near the top of the leaderboard. SaferVPN covers a wide variety of devices, including the major ones: Windows, MacOS, iOS, and Android. 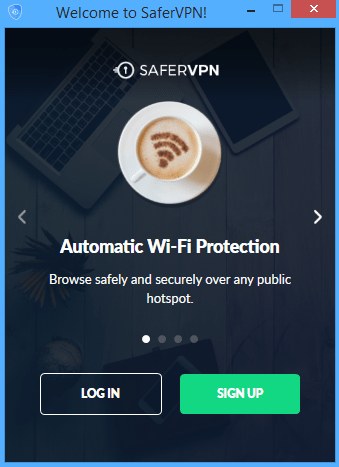 SaferVPN is also available to use in routers, consoles, and smart TVs! 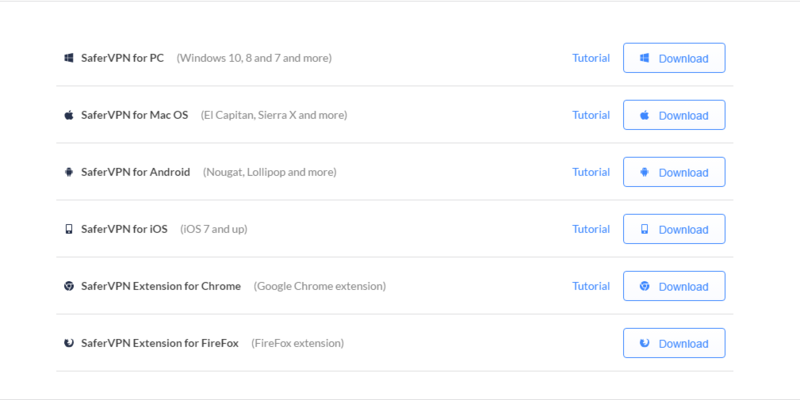 In addition, they also offer Chrome and Firefox extensions. You can also use SaferVPN with 5 simultaneous connections. Pretty standard stuff, but nice to see nonetheless. If you want to try their free trial, all you have to do is sign up by clicking any of the big green buttons. It should lead you to a page where you’ll be asked to enter your email address. If you’re ready to purchase, just click on “Get SaferVPN Now”. You’ll be taken to a page where you enter your email address and payment information. Once you’re done, they’ll send you an email to activate your account. After clicking the link in the email, it’ll lead you to a page where you’ll be asked to create a password. 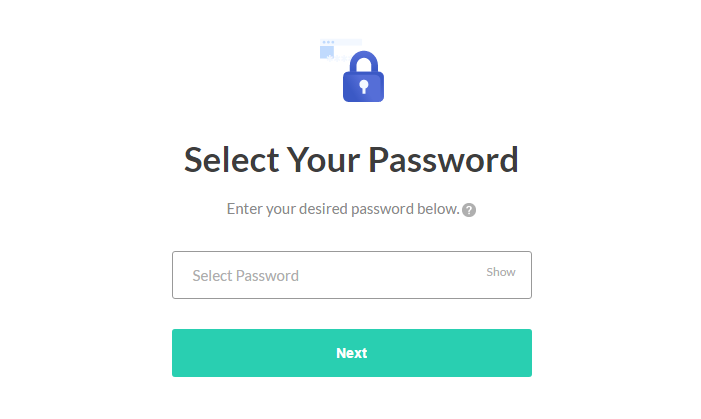 When you’re done creating a password, you’ll receive a welcome email from them which is doubles as a confirmation that you’ve already set up your account – you’re now ready to download the software and get started! From there you’ll see a download button relevant for the OS you’re using. Otherwise, go to the apps section of your account, and you’ll see the different clients they offer that you can download. What pops up next is a user-friendly interface that makes navigating the application pretty easy. If you go to their settings, you’ll see you can configure a number of options. Customer Support: How would you like help today? If you’re in need of any assistance, fear not! They offer a live chat and ticket system that you can use whether you are a registered user or not. SaferVPN, doing it right when it comes to supporting customers. The live chat will automatically prompt a message asking if you need any help, and if you have your volume up, you might notice a little notification sound play. 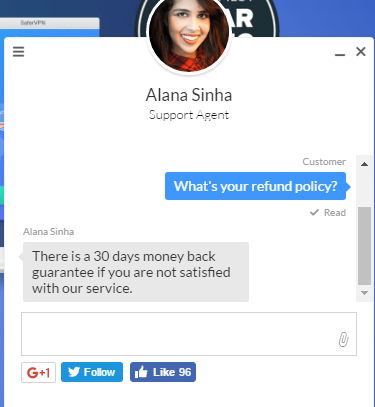 They reply quickly, and depending on your question, will give you direct answers; overall, helpful! For tickets, you have to fill in a form that requires you to put in a few bits of information. If you’re the type who wants to looks for answers yourself, SaferVPN offers an FAQ and Knowledgebase. The FAQs and “Help Center” offer everything a self-helping VPN user such as yourself might need. 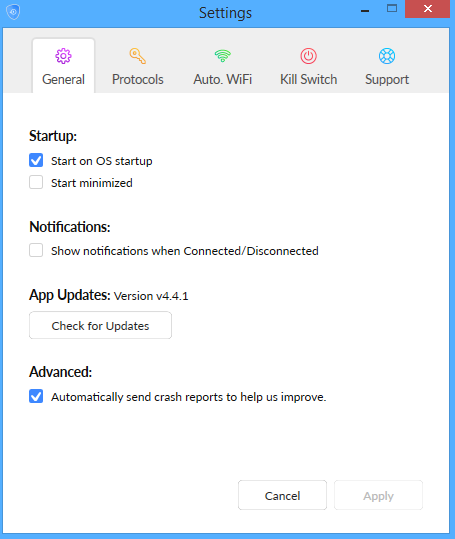 You’ll find guides for all the different devices they support, with information on how to get it set up and get going. 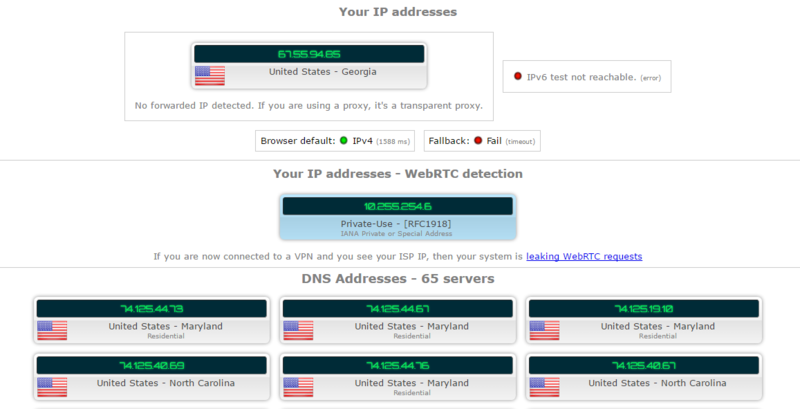 IP and DNS Leak Test: No leaks, hooray! 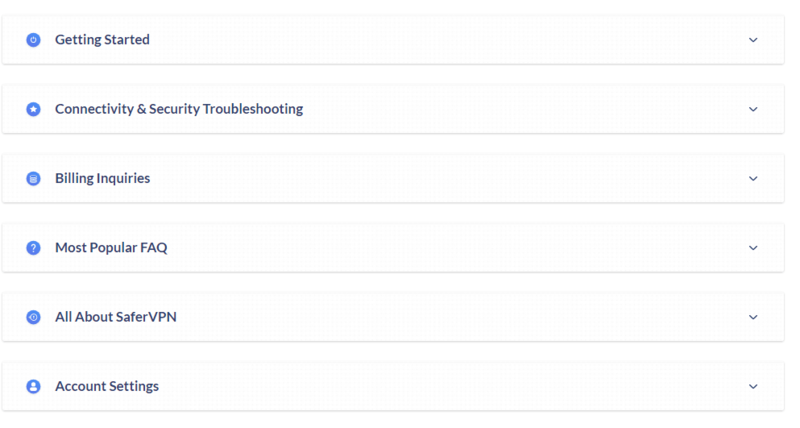 You’ll be pleased to know no leaks were found during our tests; that goes for IP and DNS leak tests. Encryption and Protocols: Everything secure here, sir! 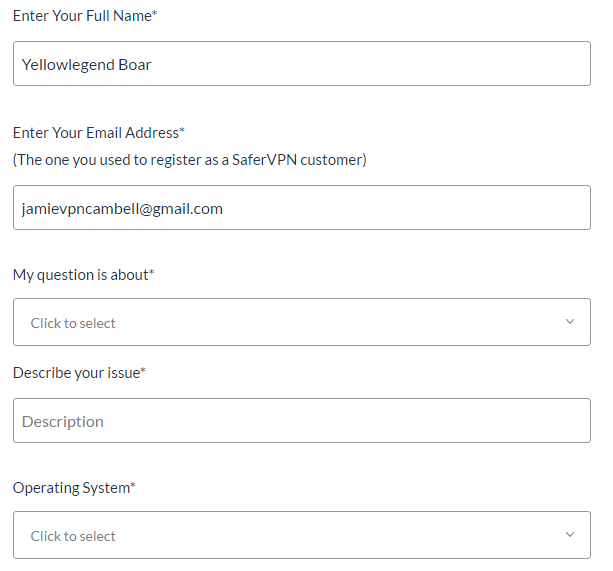 SaferVPN supports IKEv2, OpenVPN, L2TP/IPSec, and PPTP and you can manually switch to any of the above in the settings. Since they support a number of protocols, the app automatically selects the best protocol suited for the device and network you’re using. For encryption, they provide the standard AES-256 bit encryption and SHA256 for control messages. They also use Perfect Forward Secrecy (PFS), meaning they don’t use the same encryption over and over every session. They rotate their encryption key every 60 minutes, adding an extra layer to make users even safer – nice touch. Looks like SaferVPN really is safe. Kill Switch: Hit that switch! On top of the great protocols and encryption they have, SaferVPN also provides a kill switch, meaning you’re safe and protected even if something goes wrong with your server. With SaferVPN, you can pay using your credit card from Visa, Mastercard, or American Express. 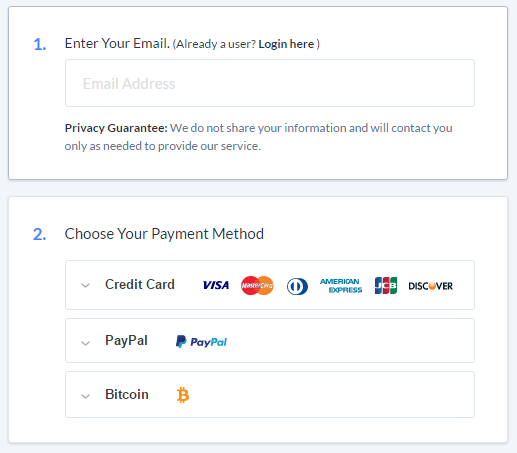 You can also pay using your Paypal account, or Bitcoin if you’re privacy-conscious. 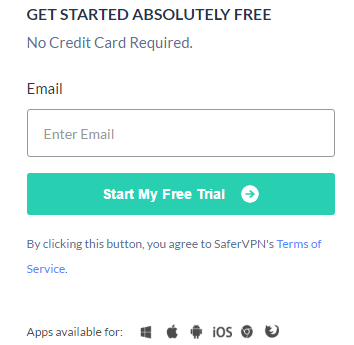 Speaking of payments; one nice thing about SaferVPN is that if you make use of their free trial, they won’t ask for any of your payment information! It might be a short trial, but at least you don’t have to waste time entering card details and such. As long as you decide within 30 days of signing up with SaferVPN, you’ll enjoy a no-qualms money back guarantee. Speeds were decent; it’s fast. You’ll find the standard 25-30% performance drop that’s to be expected when using a VPN. We tried accessing Netflix, and it turns out that it only works for US servers – bummer for people in the US. For those outside the US who want unlimited and unblocked US content with Netflix, SaferVPN will work just fine. To unblock Netflix content outside of the US, take a look at the best VPNs for Netflix. How does SaferVPN feel about P2P and Torrenting? Good news: SaferVPN allows torrenting. Bad news: it’s only on select servers; namely those in Spain, Canada, and the Netherlands. So if you’re trying to get content from those locations, you’re in luck, but if you want a VPN that gives you P2P access to more locations, we suggest these top VPNs for torrenting. 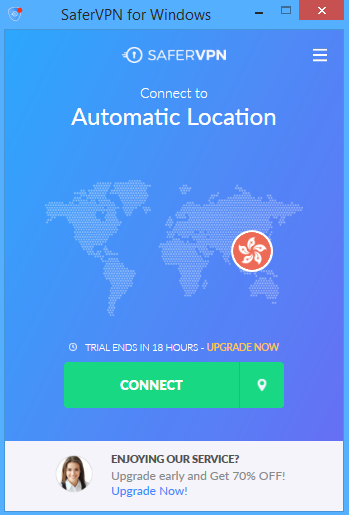 If you want to test out SaferVPN for yourself, they offer a one-day free trial – one day? Seriously, SaferVPN. Eesh. The standard is 7 days, and we often see 14 days or more. 1 day is a bit of a cop-out. 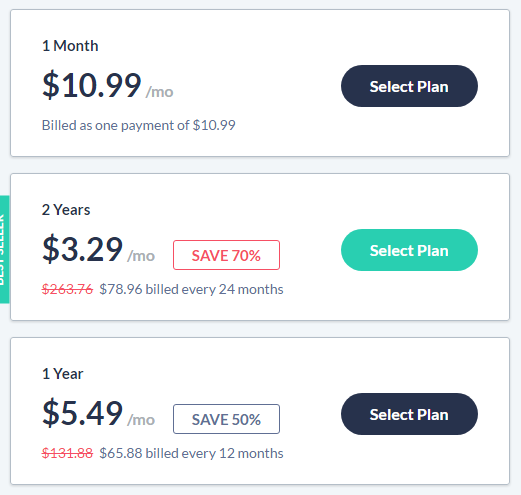 After that, if you decide to go with SaferVPN, they offer three plans: $10.99 per month, $65.88 per year, and a $78.96 for two years. If you opt for their $65.88 per year plan, it shakes out to around $5.49 per month; of course, you’re billed the full amount for the year upfront. Their $78.96 per two-year plan hits a low of $3.29 per month – pretty cheap if you decide you want to go long-term with their service. It’s cheap, but considering their average performance, I think that while their pricing isn’t a loss, it’s not a win either. Let’s remember to think about the value and not just the price. Like other VPN companies, SaferVPN claims zero logging. If you’re familiar with VPNs, you probably know by now that companies tend to advertise that they have a “zero log policy”, and whether they do or not is hit or miss. The data and time when your session begins and ends. The amount of data you’ve used. Which location/server you connected to. What country you’re connecting from. Pretty minimal logs, but logging is still logging; it’s up to you to decide how much information is too much. We prefer zero, ourselves. SaferVPN does reassure users that they don’t log any browsing activity and IP/DNS addresses. They also ignore payment information, minus the Order number; third-party payment processors that used in the transactions (i.e. the bank) will do so – bear that in mind. Two Israeli product-people Amit Bareket and Sagi Gidali thought of a business in 2013. Soon it was launched under the name “Safer Social Ltd”. 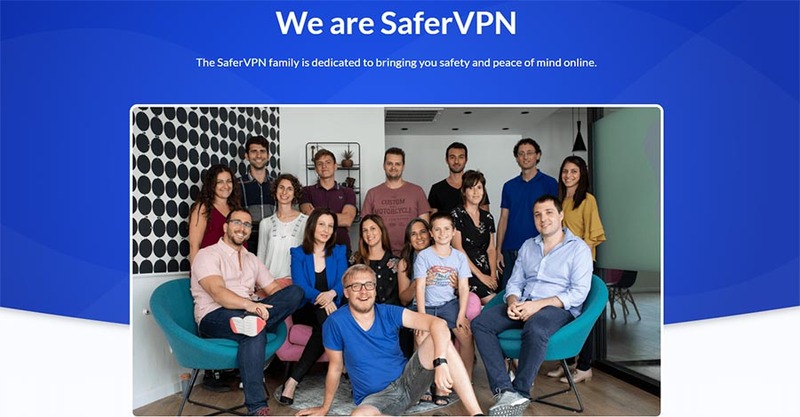 SaferVPN operates under Safer Social Ltd. They’ve come a long way, it’s now a profitable and sustainable business that helps individuals like you. Amit is a software engineer with some extensive experience in working in large enterprises while Sagi has been working around designing fluid web applications for Siemens. Both founders graduated from Tel Aviv University with a B.Sc. in Computer Science and Economics. SaferVPN launched an initiative named #UnblockTheWeb together with Movements.org, a human rights crowdsourcing platform. The initiative seeks to provide safe and private internet access to activists living in censored or restricted areas around the world. In 2017, the two founded another company – Perimeter 81. Perimeter 81 is all about having a secure network for businesses and enterprises. Their company is headquartered in Tel Aviv, Israel. You’ll be glad to know that they’re not a member of any of the Five, Nine, or Fourteen Eyes jurisdictions. With SaferVPN collecting such little information on users, we think you’ll be quite safe and secure when browsing the web; that said, there are definitely safer options that log nothing at all. Consider those if privacy is your biggest concern. 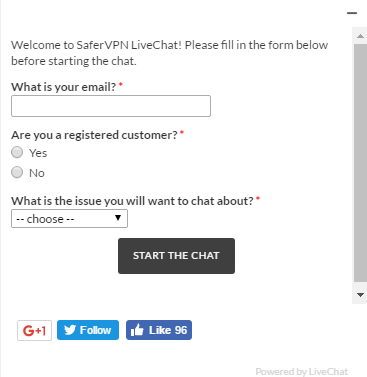 To sum it up, SaferVPN offers great customer service. It has standard protocols and encryption protection, and it’s easy to use. But for those who want to use VPNs for torrenting or streaming, this VPN isn’t ideal (but works regardless); the speeds are middle of the road too. Summing up, this VPN is a bit above average. It’s not exactly bad, but if you’re going to shell out for a VPN, why not go for something that offers a premium, 100% guaranteed service? They’re out there; in fact, read our reviews for what we consider the top VPNs in the business! But if you like the product design (like we did), like responsive support and don’t mind a little hassle (since no product is perfect), why not give SaferVPN a try?